Kind of a new idea in the world of Pokemon, PokePark has the player taking direct control of the main poke-man himself, Pikachu. Launching today across North America, the new PokéPark™ Wii: Pikachu’s Adventure game is the first Pokémon™ adventure game created exclusively for the Wii™ system, placing the world-famous Pikachu™ in a massive world filled with friends, foes and exploration. Series fans and newcomers alike are invited to play as Pikachu as they progress through a wild set of challenges, tangling with other Pokémon and racing to save the PokéPark from an uncertain fate. At the outset of PokéPark Wii: Pikachu’s Adventure, the Rare Pokémon Mew™ appears and summons Pikachu to the PokéPark. Several pieces of the Sky Prism have gone missing, and it’s up to Pikachu to retrieve them. Players take control of Pikachu to compete in a wide variety of Skill Games and Attractions, bringing Pikachu one step closer to saving the PokéPark. As they move through the park’s many action-packed Zones, players can befriend other Pokémon by defeating them in Skill Games. They can also play as other Pokémon in certain Attractions and revisit challenges again and again to attempt new high scores. Fans with keen ears will be especially pleased to note that the Pokémon speak with the same voices heard on the popular Pokémon animated series. 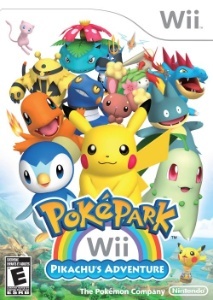 PokéPark Wii: Pikachu’s Adventure offers a versatile mix of simple-to-learn controls and captivating game play. When navigating the various Zones of the PokéPark, players hold the Wii Remote™ controller horizontally. As they step up to compete in Attractions and Skill Games, they might be asked to wave or tilt the controller to perform certain tasks. The game also allows players to snap pictures of their favorite Pokémon and locations, and store them on an SD card (sold separately).